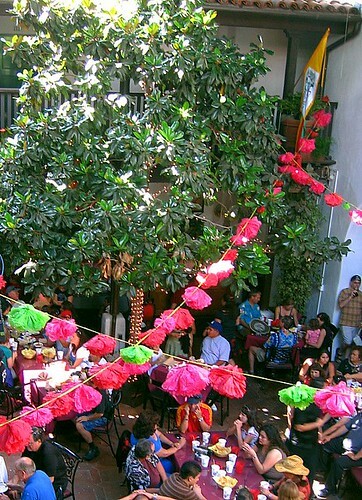 The El Paseo courtyard, also known as the "Street in Spain", is a historic treasure hidden amidst the downtown stores and restaurants along the 800 block of State Street. The State Street entrance to the paseo is topped with a row of flags - colorful banners that lift and wave in the breeze. The pathway below is flanked by two jewelry stores that showcase a rainbow array of precious stones, large and plentiful diamonds that wink and glitter, and black Tahitian pearls the size of large marbles - all displayed in a variety of modern jewelry settings. 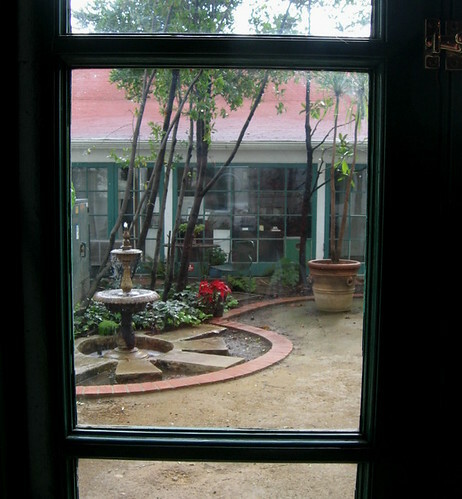 As you contine walking along the flagstones, you find yourself in a little white adobe courtyard. There, you will pass through the thick-walled doorway in front of you, and the busy world outside will drop away. 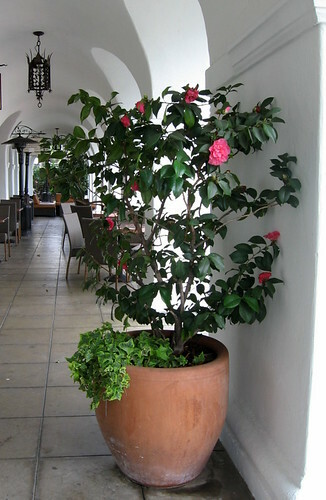 You have found your way into the El Paseo Courtyard. 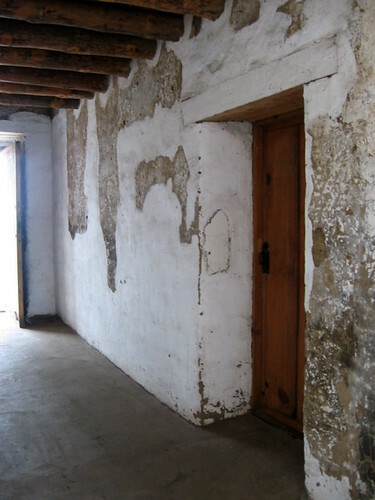 In the early 1920s, Santa Barbaran Bernard Hoffman obtained this historic property for $50,000, along with the old De la Guerra adobe next door that had fallen into disrepair. Hoffman commissioned architect James Osborne Craig to design a little paseo for the property, a small Spanish-style community oasis in the very center of downtown. After creating the initial drawings, Craig passed away, and the project was taken over by Carlton Winslow, Sr, who expanded upon the first plans. 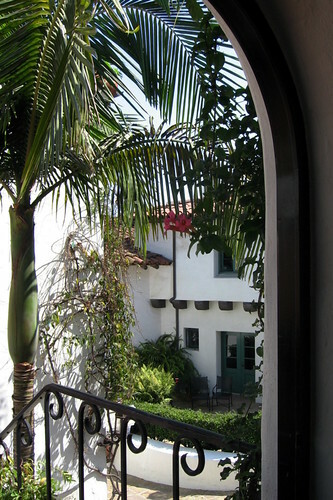 The paseo was created to be accessible from State Street, Anacapa Street, or from De la Guerra Street, through a rustic little passageway that runs along side the old adobe. The project was further enhanced when the outdoor courtyard was designed by the famed architect, Lutah Maria Riggs. It was the culmination of a shared vision that had been long in the making. Years earlier, in 1915, the Panama-California Exposition was held in San Diego to celebrate both the opening of the Panama Canal, and the city of San Diego as the first American port of call on the West coast. The exposition sparked the imaginations of Southern Californians, weaving a romantic spell that resonated with their collective consciousness. They were instantly enamored with the Spanish baroque, Spanish eclectic, and Spanish Revival styles of architecture that so beautifully suited the climate, and the fanciful, dreamy ambiance that Californians have always embraced. 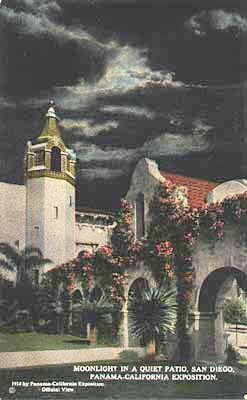 The buildings looked as though they had been created hundreds of years ago on that very spot in San Diego, amid lush and semi-tropical greenery, beneath tall, feathery palms that glistened in the California sun. 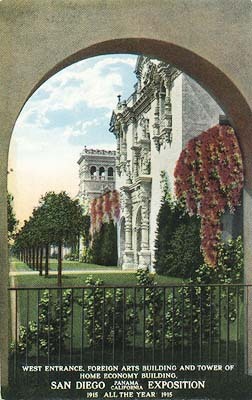 In fact, many of the temporary buildings that were created for the Panama - California Exposition were never torn down - Californians could not bear it. Their facades were made permanent; the buildings and the entire park have been beloved since their debut almost 100 years ago. In Santa Barbara, civic leaders began envisioning a Mediterranean style of architecture that would compliment their seaside town built on a Riviera-like coastline. This dream was beautifully expressed in the white stucco Spanish-style buildings of the El Paseo Courtyard that are topped with handmade roof tiles of red clay. 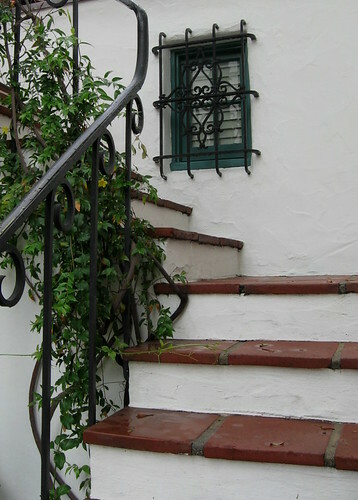 The square features hand-hewn wooden balconies, wrought iron grilles on many of the casement windows, narrow stone pathways that curve among the thick stucco walls, and tall winding stairways. 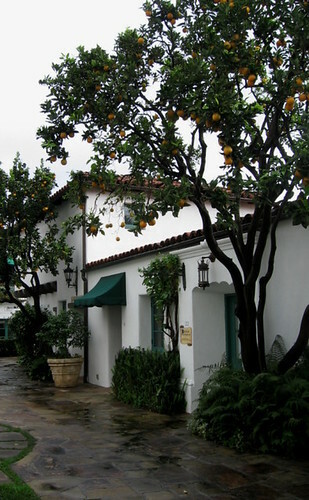 Originally, there were little shops and restaurants throughout the El Paseo, along with studios and businesses, all nestled together among the orange trees and flowering vines. Within the whitewashed walls, every day passes amid the song and splash of the fountain that lies in the center of the courtyard. The shops have been replaced by offices, and most of the restaurants are gone now. 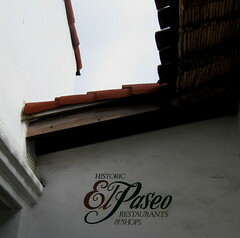 The El Paseo Restaurant remains, however. It has an indoor courtyard, open to the sky and protected by canvas awnings that can be pulled back on warm, starry nights. At the center of the restaurant are trees, and a fountain, and there is a gallery that runs along the second story above the diners. 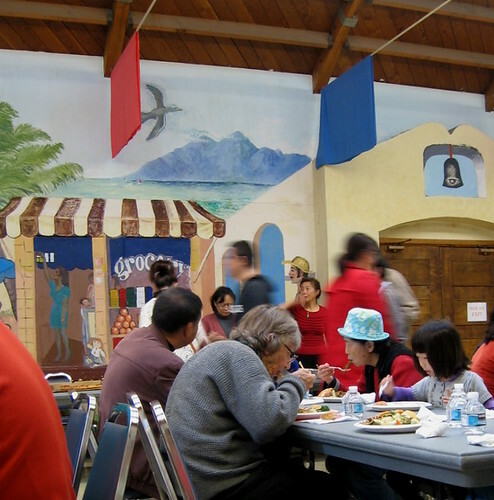 The walls are adorned with old murals depicting the colorful past of Southern California. The El Paseo Restaurant has been the site of candlelight dinners for two, parties for dozens of people, Old Spanish Days dance performances, and celebrations of every variety throughout the years. The El Paseo Restaurant offers wonderful lunchtime buffets and Sunday brunches, in addition to a full menu of Mexican dinners served at night amid twinkling lights and candles that glow on every table. The El Paseo Restaurant is a must-see destination. 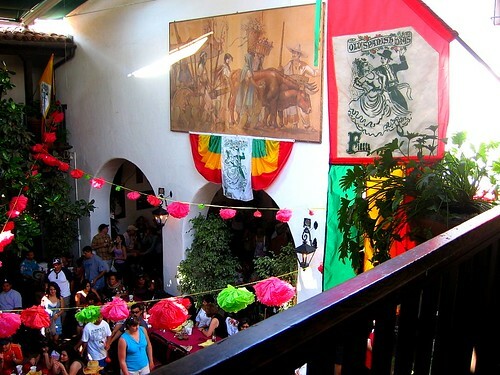 It is there that you can best experience the flavor of the City of Santa Barbara, lingering in the shaded courtyard amid trees and historic murals, with the ghosts of Fiesta past swirling around you while you sip your El Paseo Margarita. 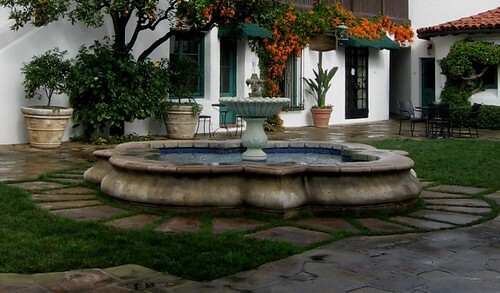 The El Paseo Courtyard truly fulfills the dream of Hoffman and his visionary architects who desired to create a little world, protected from city streets and noise, cars and other modern distractions. Here, romance and magic abound as you walk along uneven clay tiles, detect the fragrance of orange blossoms, and hear the silvery splash of a fountain, all captured within the these white stucco walls. and breathe deep the air of history and intent. This is where the modern city of Santa Barbara began to take shape, embracing the days when the adobe walls echoed the sound of castanets and hard-heeled dancers, of Andalusian guitarras and the whisper of lace fans. When I entered the Goleta Valley Community Center last Saturday afternoon, I found this gorgeous dragon resting in quiet repose. I knew that soon, the dragon would come to life and herald the arrival of the Chinese New Year, amid color, music, and lots of joyous noise. I had been anticipating the Santa Barbara Chinese American Association Spring Festival Celebration Party, and was glad the day was finally here. Our entire community was invited to join the SBCAA members in celebrating the arrival of The Year of the Ox. that included lo mein, beef and broccoli, fresh string beans, and several other flavorful and fragrant dishes. Santa Barbara residents, University of California Santa Barbara staff and students who are from China, and dozens of families and their children came together to celebrate this wonderful day. 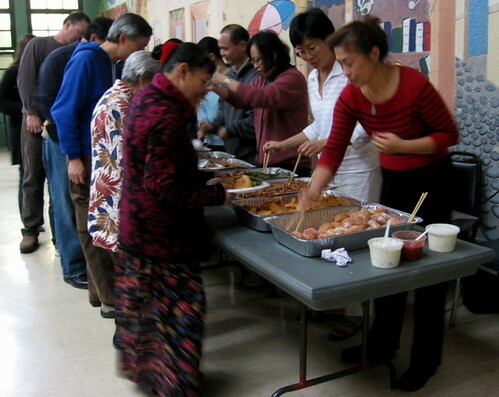 The SBCAA was founded in 1994, and includes almost 400 members who are dedicated to strengthening and perpetuating the Chinese culture locally, as well as hosting social and cultural events throughout the year for the community. The afternoon included song, dance, martial arts demonstrations,and award presentations. 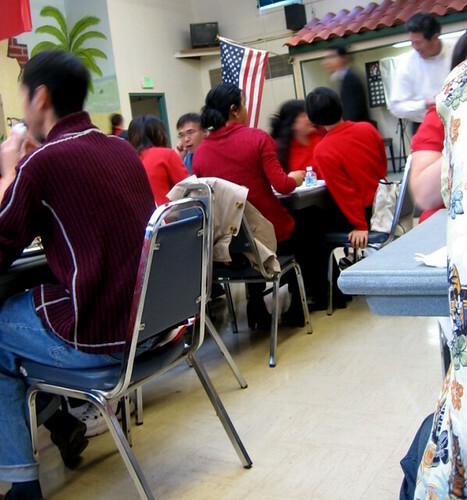 As I sat in the room, surrounded by many Americans of Chinese descent, Chinese citizens who are here visiting America, and other celebrants, I could not help but think of an account I read of the Chinese New Year celebration in Santa Barbara's Chinatown. It was written by MM Dodge and published in St. Nicholas, a children's magazine. The year was 1892. The article gives Ms. Dodge's account of the celebration that took place in old Chinatown in Santa Barbara. It includes a drawing of the two story building that still stands today on Canon Perdido Street - the original site of the Joss House in Santa Barbara. Then, as now, Santa Barbara's Chinese American community posted an invitation for all the town's residents to come join in the celebration. It was the Year of the Dragon. Chinatown was alive with activity and color - hundreds and hundreds of red firecrackers were lit - and they split the air with their deafening sound. Soon, the air was thick with smoke. Homes were opened, friends and strangers were graciously welcomed inside. Plates of sweets were beautifully displayed and generously offered to everyone who stopped in. Ms. Dodge notes that the residents of Chinatown were "wonderfully hospitable". She describes an atmosphere of beauty and celebration: sandalwood incense, paper flowers, gold and silver leaves in vases, fragrant white Chinese lilies, tiny cups full of rice, and of wine, colorful lanterns, and couplets written on large sheets of red paper. Last Saturday, as in 1892, Santa Barbara's residents of Chinese heritage opened wide the doors to their community, welcoming the New Year with hospitality and celebration. In that little hometown auditorium, the laughter and camaraderie we all shared were a wonderful beginning to the year. 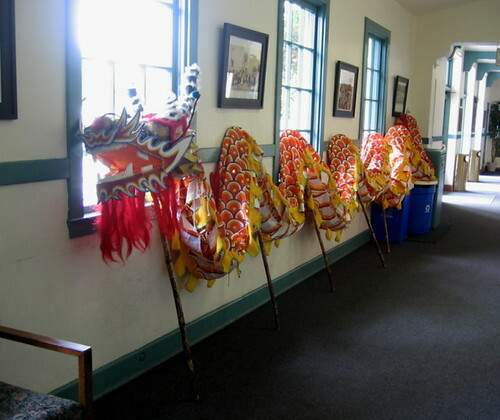 To learn more stop by the Santa Barbara Historical Museum to view the permanent exhibit dedicated to Santa Barbara's Chinatown and the history of the Chinese American culture in our county. The Lompoc Valley, located in northern Santa Barbara County, has a unique agricultural heritage. The soil in the little valley is fertile and black and rich. Lompoc enjoys mostly sunny - but cool - days. Nearby, Point Conception, a rocky slice of land that juts into the harsh, choppy waters of the Pacific, is really the northernmost tip of the Santa Barbara Channel. It is here that the coastline turns north-south once again, from the unique east-west orientation that Santa Barbara enjoys. The remainder of California's coastline - from here northward - produces dramatic cliffs and beaches, and harsh, inhospitable surf. At Point Conception, many days of the year the fog is beckoned to creep from the surface of the ocean, to curl and wind inland, creating a downy soft blanket over the land in the dark of night. This misty coverlet maintains an even temperature in the valley and prohibits extremes of heat or chill. By mid-morning, the fog retreats, the sun returns. There are also tiny inlets and coves of land beneath the hills, little valleys here and there that are dotted with chaparral and oak. There are natural springs and there are vernal pools that come to life only when the rains have been generous. There are dozens and dozens of microclimates to be found. Lompoc's agricultural legacy began with the Mission Era, when the Spanish cast mustard seeds as a way to mark the path from mission to mission. From that first introduction, the hills throughout Santa Barbara County are still covered, every year, with the tall yellow flowers in springtime. Along with the requisite mission vineyards, the Spanish also planted orchards of pears and apples, with great success. Apple crops remained long after the Mission Era had ended. John Muir, a friend of the Schuyler family in Lompoc, helped to select the site for "The Cherry Orchard" that was eventually planted in the northwestern corner of the town. Schuyler and Muir had scoured acres and acres of land, examining various soil samples and temperature variants to determine the the best site upon which to grow the fruit trees. They found the perfect spot, and cherries blossomed and grew there for several generations. And at the beginning of the 20th century, Lompoc farmers returned to the county's earliest beginnings - they began to grow mustard plants commercially. For many years, they succeeded in growing the largest mustard crop in the world. It wasn't long before flower growers like Burpee and Bodger had determined that the area was eminently suitable for growing other flowers for seed. 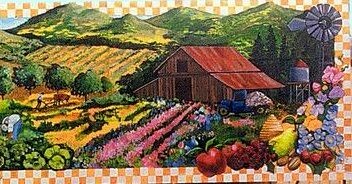 Soon, the Lompoc Valley was planted in thousands of acres of flowers that produced millions of flower seeds to be sent around the world. 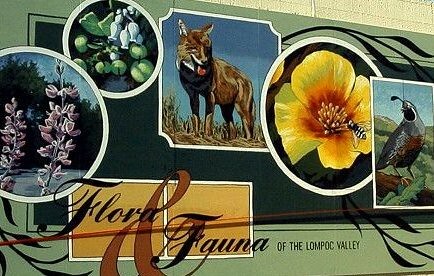 Lompoc became known as "The Valley of Flowers". Lompoc's flower industry still reigns supreme, although in response to changing times, much of what they grow is used for cut flowers. When high spring approaches, the air of the entire Lompoc Valley is imbued with a floral fragrance: honeyed sweet peas, spicy stock, and the sentimental perfume of alyssum, borne above drifts of its white flowers. There are miles and miles of dazzling fields that bloom with larkspur, California poppies, petunias, pinks, pansies, and more. And of course, wine lovers around the world are familiar with the wines that are produced from grapes grown at the base of the Santa Rita Hills that lie near Lompoc. Award winning wineries abound in this area. The climate is also perfect for more prosaic crops, like broccoli, artichokes, celery, and lettuce. The Lompoc Valley has always been home, also, to a variety of cultures: Americans from the midwest and east coast, Mexicans, Japanese, Chinese, Portuguese, Swiss all converged here. Despite their differences, they shared a common bond - agriculture. In the early days, before irrigation and the sophisticated potions and methods that define modern agriculture were employed, crops were coaxed from the land using little more than hard work, a deep connection to the land, and a spirit of community. The farmers shared in the labor of planting and harvest, so that everyone might be successful. Many of these early settlers and community leaders are buried in Lompoc's Evergreen Cemetary. It is here that Gin Chow (1857 - 1933), one of Lompoc's most unique residents, lies beside his neighbors. On his tombstone is an inscription that reads, "The Prophet." It is a title that was bestowed upon him by his neighbors and admirers, those who benefited from his ability to accurately predict the weather - and many other things. Gin Chow left Canton, China, for California when he was 16 years old. 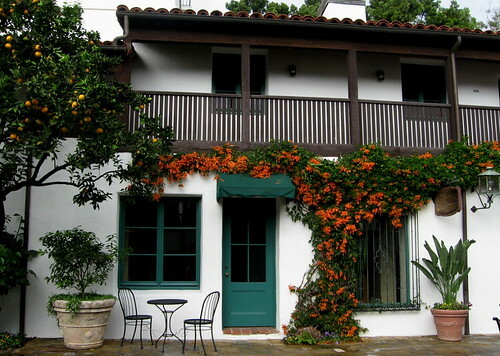 He arrived in Santa Barbara, and worked as a cook, a domestic, and a gardener. He worked hard, saved money, and eventually purchased a tract of land in Goleta. In the 1896 edition of the West-Coast based American Missionary Magazine, it was noted that "one of our brethren, Gin Chow...has a little plantation of fruits...about twelve miles from Santa Barbara. In the rich soil in front of his house was a bed of strawberries red with clusters of ripening fruit. 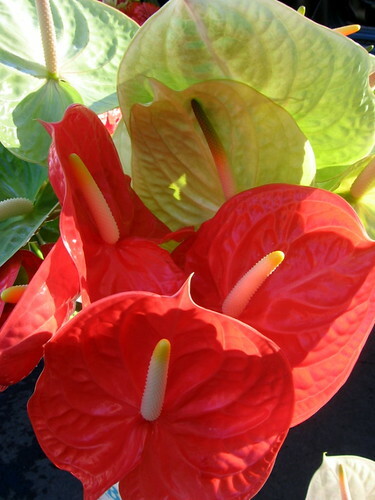 The plants were so arranged to spell out, very distinctly, these words: 'God Loves the Earth.'" And Gin Chow loved - and understood - the earth. Only a few short months before the Chinese Exclusion Act was passed, Gin Chow purchased some land in Lompoc. According to Santa Barbara, American Guide Series, printed in 1941, Gin Chow's home in Lompoc was found alongside the Santa Ynez River, "a little brown shack among the willows", next to the Robinson bridge . Gin Chow grew a variety of crops on his "truck farm", including strawberries and melons. He would travel from town to town and sell what he grew. His neighbors began to notice that his conversations about weather, his predictions, were precise and accurate, to an uncanny degree. There was little in the lives of those early farmers that mattered so much as the weather. In that era, all Santa Barbara County farming was "dry farming". The success or failure of an entire year depended upon the weather. Eventually, Gin Chow's predictions would be printed in newspapers for all to see. He was precise, predicting not only the exact day that rain would come, but how much it would rain, as well. He could foretell a drought, and say precisely when it would end. Of course, he was wrong on occasion. But he was right more often than scientists were, and the people who worked the land trusted him more than they trusted the men in labs. "August - Boys can fly kites easy on the 5th of August but light rain wet down dust on 6 to 7." "September - Come three hot days so men sweat in fields an' foam come on horses on 21 to 23." "December - From 18 to 21 come rain alla same as had after Christmas last year when water fill up my river an' rush under bridge like Chinese devil." He predicted a huge earthquake in Yokohama, which materialized as he said, in September of 1923. Eventually, Gin Chow was well-known up and down the Pacific Coast. He was quoted and written about in the Santa Barbara Daily News, the LA Times, and other publications. He made guest appearances at service clubs and meetings. He spoke several times on KHJ radio in Los Angeles. He appeared on newsreels that were shown in movie theaters. He was the opening act at Graumann's Chinese Theater, making predictions for the crowd on the night that King Kong made its debut in 1933. He had become a celebrity. He took no credit for his prognostications. He "says he determines his findings from books left by his grandfather and passed down through the Gin family." He attempted to educate Americans in understanding that the ancient Chinese culture had perfected the art of observation, of understanding the cycles of living, of the relationship between man and earth. His predictions were not magic - they were foretold by Nature herself - all one had to do was to humbly observe. At the end of his first almanac, Gin Chow wrote a section entitled, Celestial Morsels. One of them reads, "Wise man richest of all. More than Rockerfeller." Gin Chow shared his wisdom with all who would listen.